Do you suffer from Computer Neck Syndrome? If you sit for a prolonged period at a computer, monitor, or television with improper posture, then you really do develop a pain in the neck. Driving for a prolonged period with improper posture can cause the same issue. The problem is the stress that is being placed on the joints when poor posture occurs. The muscles around the joint receive stress as well. The neck is particularly susceptible to this stress, so pain occurs with greater frequency. In effect, poor computer posture causes your neck muscles to be overworked. That overuse results in pain. To treat the issue, the first step should be to visit a chiropractor or medical professional. This will create a treatment plan that will help you to maintain the alignment of your neck and spine. 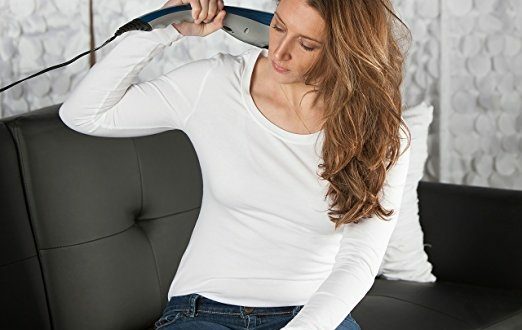 Then supplement those treatments with self-therapy administered through the best neck and shoulder massagers. For most people, the pain being experienced in the neck is caused by the head being in a forward position for too long. Over time, if the posture is not corrected, it can actually straighten the natural curve of the cervical spine, which creates chronic pain that can be difficult to treat. When the spine straightens, it changes how the structure distributes load-bearing weight. That leads to degenerative changes to the neck and back which can limit movement. Sit in your chair with your shoulders rolled back as much as possible. Keep your back straight, but in a comfortable position. If you feel your back slumping, straighten it. Adjust your computer monitor to be at eye level as well. Many computer users look downward to their screen, which encourages the head to move forward. Then take a walk for about 5 minutes for every 60 minutes of computer work that you do. As you walk, be sure to maintain a proper posture. Even if you haven’t always been sitting properly, walking with good posture can help to remove some of the stress being experienced. Regular massage can relieve the tension being experienced from Computer Neck Syndrome, but it will not prevent a straightening of the natural curvature of the spine over time. If chronic pain is already being experienced, the time to act is now. One effective method is to change how you work. Instead of using a traditional computer desk, try using a standing desk instead. For general work needs, we highly recommend the VersaDesk. If you typically use a laptop for your computer work, then an adjustable laptop stand is an affordable option to help change the angle of your head and neck while you work. We recommend this option from Executive Office Solutions. 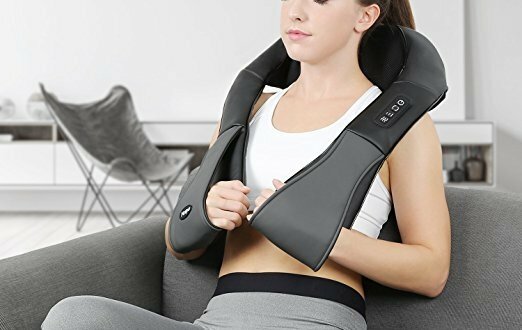 Your neck shouldn’t look like a jumbled mess after a day of sitting at the computer. By taking proactive actions now and arranging treatment options that can help you find relief when needed, you’ll be able to handle a computer-based career without chronic pain.